Statclean Technology India Pvt. Ltd. offer Injection Moulded Cleanroom Chair. 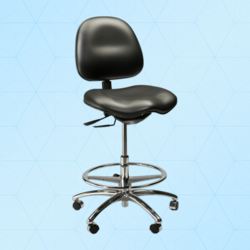 Cole-Parmer offers Cleanroom Chairs and Stools compliant to ISO Class 5 (Formerly Class 100) for vinyl models; ISO Class 4 (Formerly Class 10) for Polyurethane Models. • Ideal for Medical and Cleanroom environment. Cleanroom chair or visitors chairs made in stainless steel it can be either single, two or three seater and it is compatible for any class of a cleanroom. Cleanroom chairs are designed to provide operator comfort as well as meet and exceed the critical cleanliness requirements of today's cleanrooms. - Customized to fit workers and their tasks. 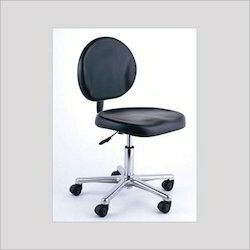 - Height adjustment is easily controlled by a soft touch pneumatic mechanism.